Released Tuesday, October 6, 1959. Producers: Jimmy Johnson, Tutti Camarata. Musical Supervision: Carl Stalling, Wilfred Jackson, Bert Lewis, Frank Churchill, Leigh Harline, Paul J. Smith, Oliver Wallace, Leopold Stokowski, Edward Plumb, Ken Darby, Camarata, George Bruns. Edited and Mastered at Sunset Sound Recorders, Hollywood. Running Time: 55 minutes. 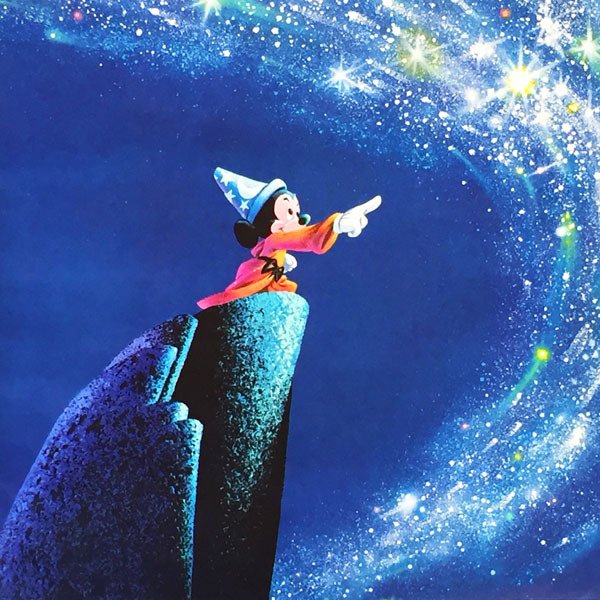 Voices: Walt Disney, Pinto Colvig, Dorothy Compton, Mary Moder, Adriana Caselotti, Harry Stockwell, Cliff Edwards, James Baskett, Ilene Woods, Jimmy Macdonald, Mary Costa, The Philadelphia Orchestra, Disney Studio Orchestra, The Jud Conlon Singers. Disneyland Records was experiencing growing pains in 1959. Even though Annette Funicello’s hit records were beginning to boost sales, the division had yet to turn a profit since it started in Spring, 1956. 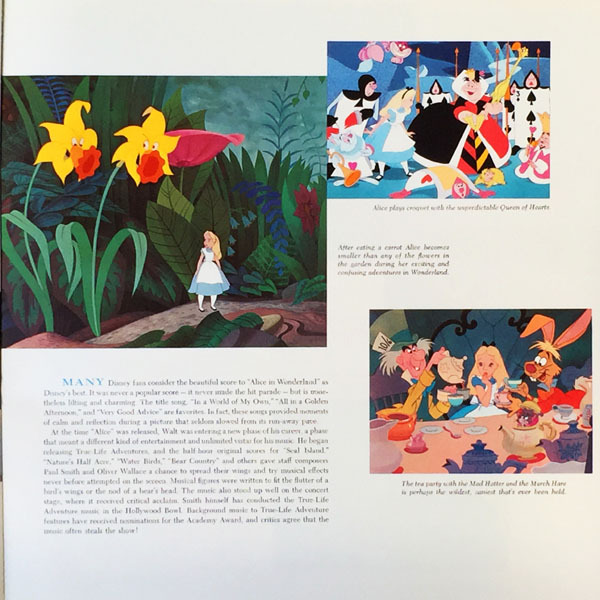 Disney Legend Jimmy Johnson, who ran the publishing division and Walt Disney Music Company and started what is now Walt Disney Records (the latter only after years of persuading Roy Disney), was overhauling the manufacturing process and redefining the vinyl product lines. This was the year that the first wave of albums—previously (and unsuccessfully) marketed as mainstream soundtrack albums to appeal primarily to adults at premium prices—were going to be marketed as children’s records. The prices were cut in half, the art was redesigned to be simpler and some material was edited for, hopefully, more plays per listener. The strategy worked, but it took time. 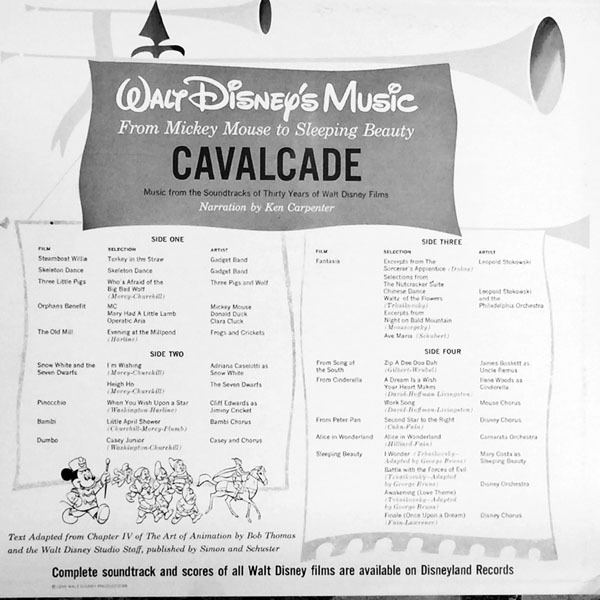 Walt Disney’s Music Cavalcade provided a vinyl transition of sorts. It was a premium-priced “WDL” series release, but it celebrated the music of Disney classics, reminding the public how great it all was. Produced like a documentary, the album plays out like an excerpt-rich retrospective episode of Walt Disney’s weekly anthology TV series. 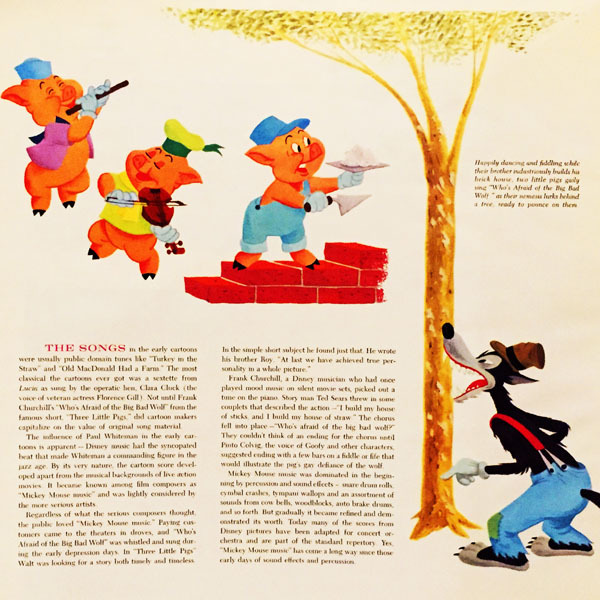 Indeed, the first season of the Disneyland TV series on ABC had already yielded an installment called “Cavalcade of Songs.” The first half of this episode consisted of musical clips from Three Little Pigs, Snow White, and Song of the South. The second half promoted the upcoming 1955 release of Lady and the Tramp, featuring superstar Peggy Lee and songwriting partner Sonny Burke reenacting the vocal doubling process used in recording the “Siamese Cat Song”. “Cavalcade of Songs” was later reedited and updated to promote other musical films, such as Bedknobs and Broomsticks. In his one and only Disneyland Records appearance, radio and TV announcer Ken Carpenter is ideal in his role as narrator. Carpenter was a ubiquitous vocal presence in the mid-20th century, heard on countless commercials, movie trailers as the announcer for The Life of Riley, The Great Gildersleeve, Edgar Bergen and Charlie McCarthy and Al Jolson, and in particular, Bing Crosby’s shows for over a quarter century. 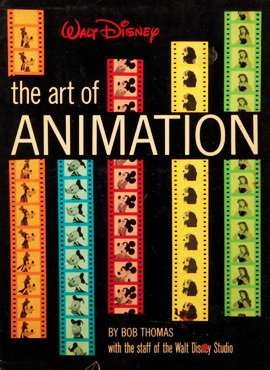 A year earlier, Johnson had spearheaded the creation and publication of one of the most cherished Disney nonfiction books of all time, The Art of Animation by Bob Thomas. The number of careers this book has inspired cannot be calculated, as one animator or another is forever rhapsodizing about either being lucky enough to own a copy or constantly checking it out of the library. The book combined Johnson’s tenacious quest to carry out Walt’s request and his own experiences within his various divisions of the company. 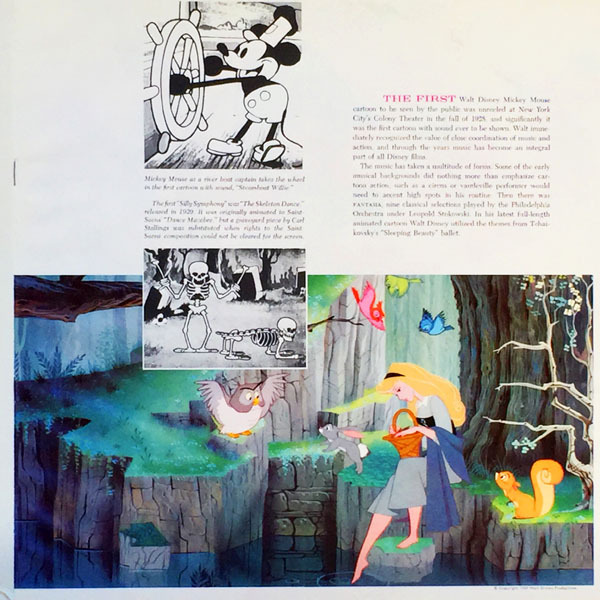 The book was published in the manner of a deluxe Golden Book, since Western Publishing had such a strong bond with Disney through books, record album texts and an investment in Disneyland. In his 1975 autobiography, Inside the Whimsy Works: My Life with Walt Disney Productions, Johnson recounts the book’s history, beginning in the 1930’s when Walt Disney set up an art class across the street from his Hyperion studio. It was run by Don Graham, one of the instructors at Chouinard Art Institute in Los Angeles. 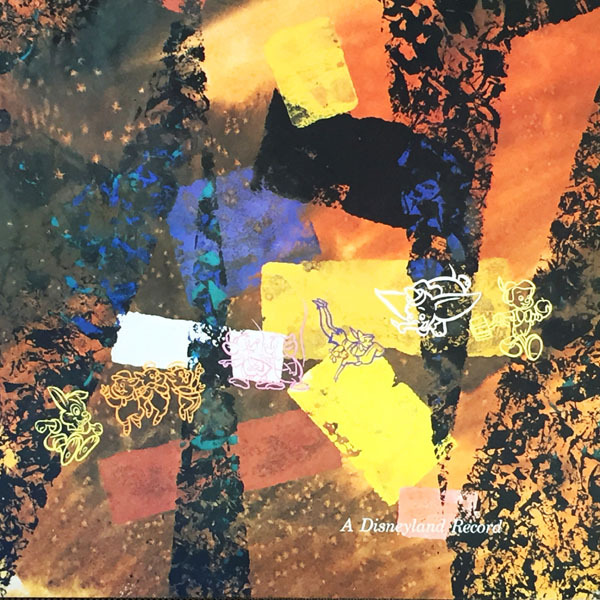 The idea was to broaden the skills and talents of the artists with exposure to a wide variety of artistic approaches. 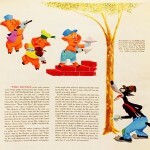 “In the early fifties, Walt commissioned Don Graham to write a book to be entitled The Art of Animation. Don worked for several years on the project, compiling some very valuable research material. Walt found his writing too “scholastic.” He wanted the book to be one of general interest, not just a textbook for artists. So Walt asked me, as head of Disney publications, to find a writer for the book. “On a New York trip I met Howard Barnes, former drama and movie critic for the New York Herald Tribune. Howard’s reviews of Disney films for the Tribune had not been puffs, but were eminently fair and very respectful of animation as an art. Howard was “at liberty” and interested in doing the project, so I recommended him to Walt. “Howard came to the studio and began work on the book, using Don Graham’s research as a basis. He completed about seven chapters, but Walt found his writing too breezy. He felt that Howard was not making sufficient use of Don Graham’s research. Howard was dismissed from the job and my search began anew. “This time I came up with Bob Thomas, who had been the Associated Press man on the Hollywood scene since 1944. I worked very closely with Bob on the book as did many others at the studio. 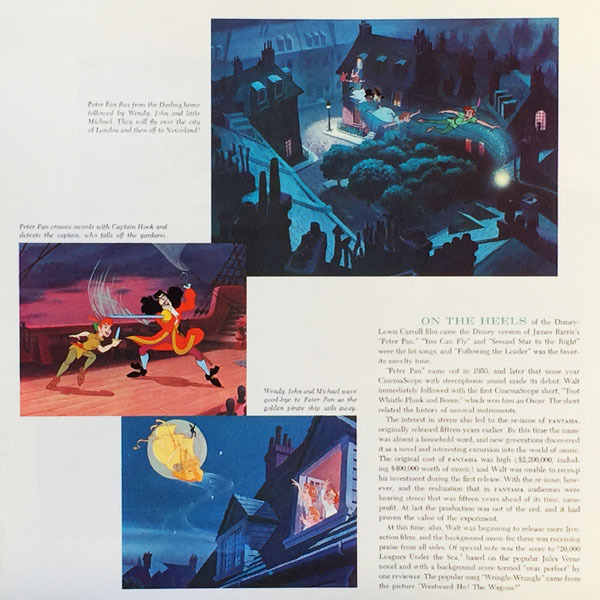 “The Art of Animation was finally published in 1958 by Simon and Schuster… The writing credits read: “Walt Disney, The Art of Animation, the story of the Disney studios contribution to a new art. By Bob Thomas with the Walt Disney staff with research by Don Graham.” I didn’t have any official title in connection with The Art of Animation but I did coordinate the entire project. One of my contributions was the compilation of the animation credits found in the appendix of the book. “In the last year of his life, Walt was asked what he considered his greatest accomplishment. He said immediately, “The creation of my organization.” The compilation of animation credits in The Art of Animation was the first such listing of the creative contribution of Walt Disney’s organization. It only goes up to the year 1958 and it sorely needs updating. “Ever the master of the cross-plug, Walt used the soon-to-be-released Sleeping Beauty to tell the story of animation in the book. 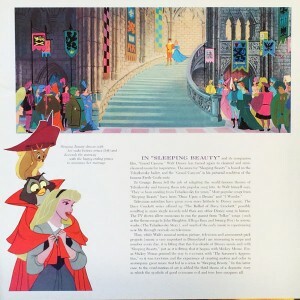 The blurb on the jacket reads in part, “His researchers touched upon the full history of animation, and his story is brought up to date by an intimate view of the production of Sleeping Beauty, latest of the Disney features and in many ways the quintessence of the art of animation.” While Sleeping Beauty was the most expensive animated feature made by the Disney studio, the animation was not the quintessence. It was stylized and sterile, not to be compared with the free-flowing art of Pinocchio, Fantasia and The Jungle Book. Thomas’ highly regarded Walt Disney: An American Original was published in 1976 (a year after Johnson’s passing) and reprinted in 1994. 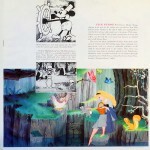 It is no accident that Walt Disney’s Music Cavalcade bears such a striking resemblance–right down to the modern art sponge paint gatefold cover–to one of Disneyland Records’ most successful early releases: the three-LP soundtrack set of Fantasia, which was released one year earlier in stereo and two years earlier in mono. And as proclaimed on the inside front cover, the text of the book was adapted from Chapter 4 of The Art of Animation. The page layout follows the look of the book as well. Clearly, both The Art of Animation and Music Cavalcade were near and dear to Johnson. His contributions, particularly to such a revered book, warrant wider acknowledgement. 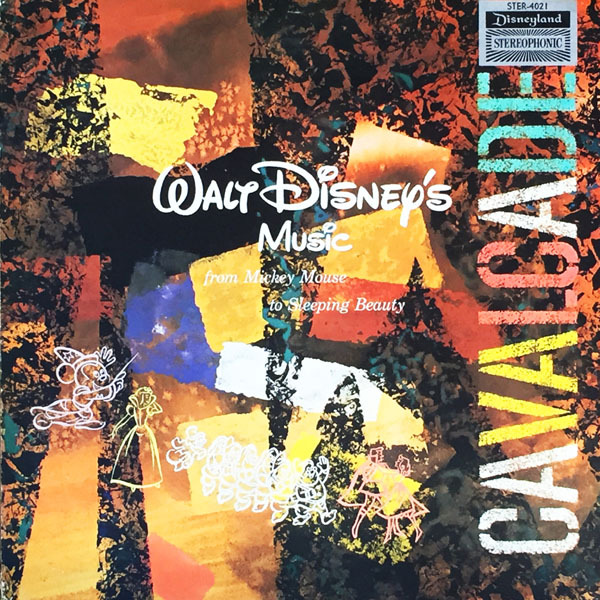 On the cover of Music Cavalcade is the phrase, “From Mickey Mouse to Sleeping Beauty”, a line echoed only a few years later (“From Snow White to Mary Poppins”) on a 1966 Buena Vista album called The Music of Walt Disney. This LP, however, would emerge in the midst of great sorrow as it was produced as a musical memorial to Walt. It is staggering to realize how little time passed between the two albums. 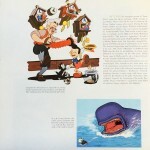 These are all of Carpenter’s segments from the album, including short excerpts from Steamboat Willie, Orphan’s Benefit, Three Little Pigs and The Old Mill. 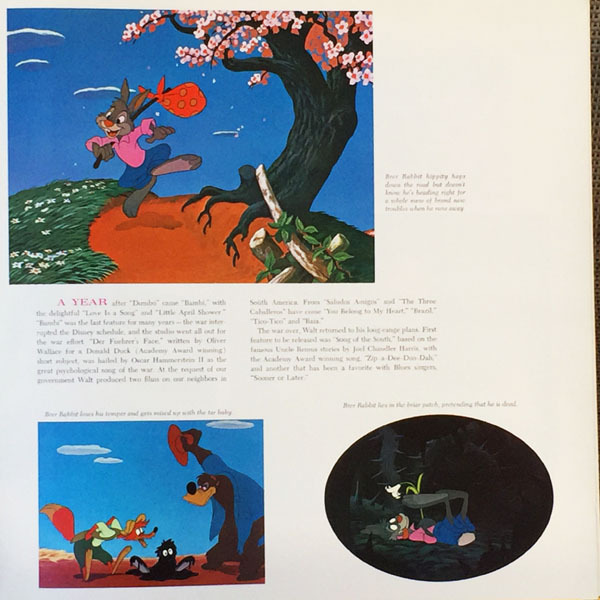 The latter two are presented in their entirety, along with every Silly Symphony cartoon soundtrack, on the new Silly Symphony Collection 16-disc vinyl album set. I never knew this one existed before. This is a rare treat. Sounds like some of the soundtrack material consists of selections that were used later on. The “Steamboat Willie” and “Orphans’ Benefit” tracks were re-employed for “Mickey Mouse: This is My Life” which came out in the 70’s. “The 3 Little Pigs” soundtrack was used on other albums. Ken Carpenter’s narration for this album is new to me. He does a good job. If I had known about this album years ago, I would have scoured used record stores to find one. By now, of course, most of the material is available on CD or vinyl. I’m really surprised about this one, because retrospective albums with narration were and still are rare from Disney. There have been many, many tribute compilations–but they are always all music with no narration between pieces. very interesting …. 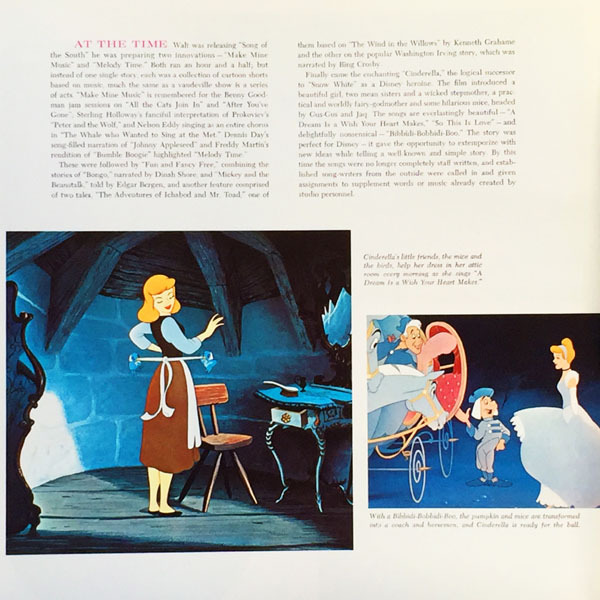 thanks for sharing this … as an ardent Lady and the Tramp aficionado, I find it interesting that the album has at least one song from ever Disney animated features up to 1959 except Lady, especially since half of the program Cavalcade of Songs was devoted to it. I’m guessing it has to do with licensing/contract issues. You are very likely correct about contracts, since the Lady and the Tramp music was released on Peggy Lee’s label, Decca. Disneyland Records did not even have a Lady and the Tramp record in their catalog until the early ’60s, when the “studio cast” storyteller and song albums were released. I am a record collector and was lucky enough to find a copy of this in VG+/VG+ condition. It has been a real treat listening to it. I have looked it up on Discogs.com and eBay and have found a description of it with a purple label. Mine is black. 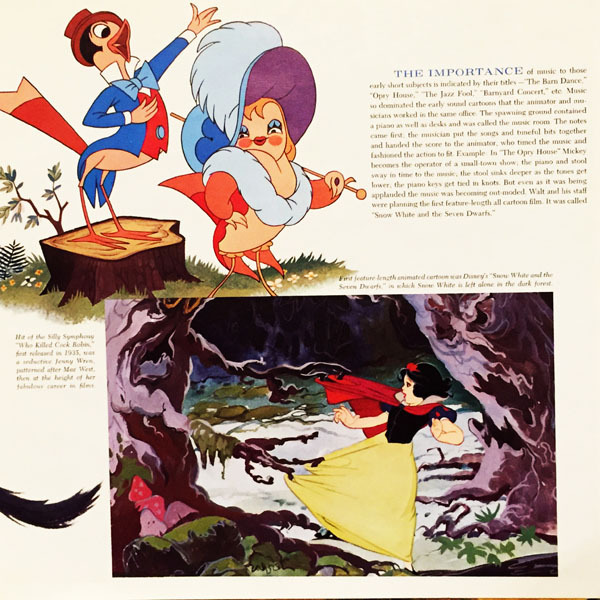 The storybook pages are still inside and in good condition. I have yet to be able to price its value. I usually find these not worth the amount I would expect.